April 19, 1962 – Mayor Richard J. Daley presents a revised plan for the development of 60 acres of the area east of Michigan Avenue and north of Randolph Street, today’s Illinois Center. The mayor says, “This proposal has been prepared to assure the orderly development of one of Chicago’s most valuable areas. It is a vast undertaking that can provide more than 30,000 persons who could enjoy nearby employment, cultural, and recreational facilities. This development will increase tax revenues and will be a great stimulus to the future growth of Chicago.” [Chicago Daily Tribune, April 20, 1962] The city plan commissioner, Ira Bach, indicates that the development of the Illinois Central Railroad’s air rights in this area could provide 12 million dollars in real estate taxes each year. The area about which the Mayor speaks is the area enclosed in the dotted lines. Looking at this area as well as the area north of the river today is a visual lesson in the positive and negative aspects of urban planning. 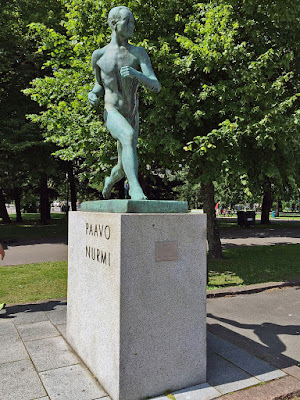 April 19, 1925 --The Flying Finn, Paavo Nurmi, wins the 3,000 meter run at the first annual Loyola Relays at Grant Park stadium, today's Soldier Field. Rain in the morning leaves the track in poor condition, and the weather is cold and blustery. Still, 5,000 spectators watch as Nurmi covers the distance in 8:49.25, considerably off his world record of 8:32. The sensation from Finland is content to let fellow countryman Willie Ritola lead the pack through the stiff northerly winds until two laps remain. On the last curve he passes Ritola and goes on to win by 20 yards. Refusing to pose for pictures, he gathers up his gear and heads into the locker room as the crowd cheers. In difficult conditions he and Ritola are the only two runners to finish the race. The statue of Nurvi, pictured below, stands outside the Helsinki Olympic stadium.